Print-on-demand services are really popular on the internet right now. You’ve probably seen these websites, where you can design your own t-shirt, coffee mug, calendar, etc. and have it printed up. The nice thing about these websites is unlike most printing companies, you can have a single item printed rather than being forced to buy a bulk amount. Everyone from famous comedians to musicians are using print-on-demand these days; there is no overhead cost to them, so it’s a great option to get merchandise out there. But print-on-demand is more than just funny posters and band logo t-shirts. Did you know that these services can also be great for creating the perfect gift for pets and pet lovers? For example, some of these websites allow you to custom design your own doggy shirt. 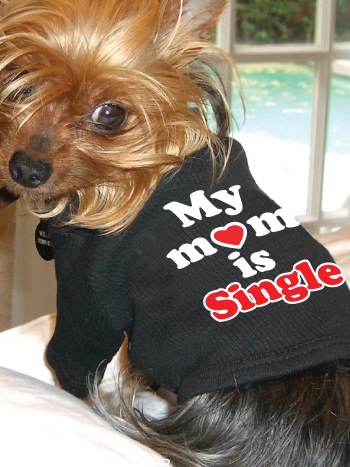 If you’re like me, you probably think that most of the commercially available doggy tees with sayings on them are less clever than they are just plain…lame. With print-on-demand, you can design your own doggy tee or choose from the thousands and thousands that other users have created. The possibilities are literally endless. A custom doggy tee would make a great gift for your pup, or any other stylish dog you might know. Beyond doggy tees, there are literally millions of ways to design the perfect gift for yourself or any pet lover with print-on-demand shops. You could create a calendar containing photos of your pet, an iPhone case with your pet’s photo on it, a coffee mug with your pet’s cute mug on it, a photo necklace of your favorite animal…and on and on. There are so many different items available to design (clocks, mousepads, ornamenents, etc.) I literally cannot list them all. Instead of visiting store after store looking for just the right gift only to find they carry that cute greeting card in every breed *except* your friend’s favorite, or they don’t have the adorable Dachshund t-shirt in your size, just check out an online print-on-demand shop. Finding the absolute perfect gift will be easy and painless. Mark your calendars for Madison's first annual Dogs on the Square! Admission: $10 per dog, humans are FREE! Tell your friends, grab a leash, round up your furry companions and join us at the Capitol Square for a fun packed day of games, contests, prizes and more. You won’t want to miss this event! The event begins with a Dog Walk around the Square at NOON, immediately followed by sponsor-led games and challenges. Turn in your Challenge Card to win an assortment of great prizes. Don’t miss out!